At the end of April, a colleague and I packed our bags and drove to the airport. Then came 2 long-haul overnight flights and 1 short-haul flight interspersed with lengthy layovers- 42 hours travel time in total, but who’s counting? 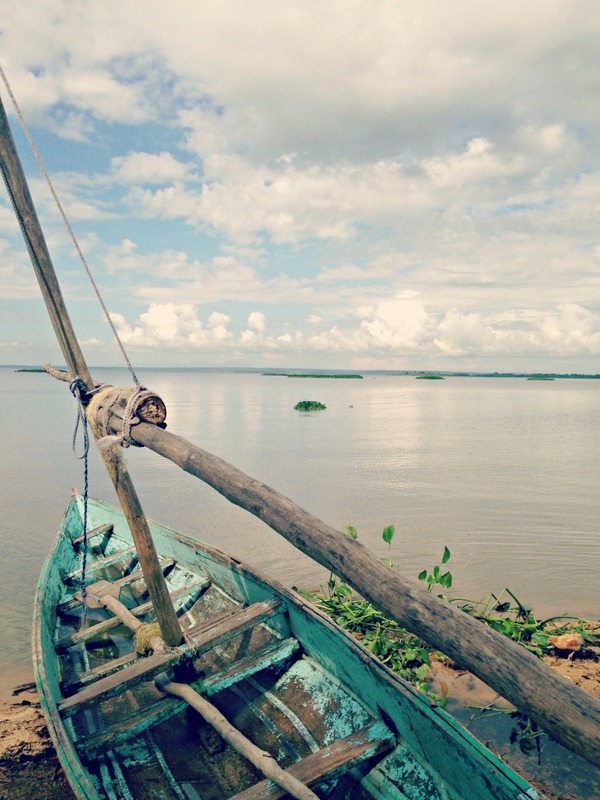 We landed on the shores of Lake Victoria in Kenya’s third-biggest city, Kisumu. Right on the equator- zero degrees latitude. It was my first visit to Kenya, indeed my first trip to the African continent, but it felt like home right away. Maybe that’s because the project that I’ve worked on for over two years is based in Kenya, and so I work with Kenyans and for Kenya even when I’m in the States. As soon as I met my colleagues in person for the first time, it was like having an instant family there. For a few weeks in May, I did get to live and work in Kenya as a local. We rented an apartment in town- a huge, lovely furnished terrace flat with a dozen large windows for the lake breezes to come right in. The weather was a total (and very pleasant) surprise to me. I expected to sweat it out on the equator, and instead, the temperature hovered between 68 and 78 degrees Fahrenheit the whole time I was there- basically my idea of paradise. I’m told that this has to do with the altitude, lake effect and the season of “long rains”, a season when thunderstorms come through almost every afternoon and leave everything lush and green and cool. I chose a good time to visit. At other times of the year, the weather apparently gets much more sweltering and equatorial. After weeks of perfect temperatures, I landed in Atlanta on a 90-degree afternoon and said to myself, boy, do I have to go back to Africa for some cooler weather? From Monday to Friday, we commuted to work, a forty-minute car or bus ride, half of it over dirt roads. I worked long hours, trying to make the best of the relatively little time I had there. Breakfast and lunch were served at the staff canteen, and the menu was the same every single day. Breakfast: White coffee (milk and water boiled together, with brown sugar and good old instant coffee stirred in) and Spanish roll- an omelet with peppers, onions and tomatoes rolled up in a chapatti. The other option for breakfast was mandazi- a huge donut like fried fritter but I never did try one. Lunch was ndengu (green gram/lentils stew), cabbage and sukuma wiki- sautéed greens. For meat eaters, there would be a meat stew and fried fish or chicken. Fruit salad came with chunks of watermelon and tropical fruits- pineapple, mango and avocado. After work, we would often stop by the supermarket and pick up groceries, then cook a meal at home. We made spaghetti a couple of times, with cheese from Amsterdam, pasta from Italy (another colleague had just vacationed there), sauce with local ingredients, all washed down with South African wine. Another time I made chana masala and cabbage, and one weekend morning we made an elaborate brunch- pancakes with jam and omelets. It is so much fun shopping in a foreign supermarket, where things are familiar yet different. I liked Kenyan tea- it is milder than the Assam tea that I’m used to, and in these weeks, I got used to drinking black tea- no milk, no sugar. And of course I had to check out the snack aisle and try Kenyan chivda and chilli-lemon flavored potato chips. Occasionally, we went out for dinner at different restaurants in town, for Ethiopian food, Chinese food and Indian food (they had the best paneer I’ve ever tasted). Indian food isn’t just found in Indian restaurants, it has a large influence on Kenyan food in general. Pilau (pulao) and chapatti and samosas can be found everywhere. I ate my weight in samosas, starting at the airport café at Nairobi! And one menu item I noticed in all bars and restaurants was chips, not the crisp packaged potato chips but what in India is called potato chips and in the US, French fries. My favorite dinner, without a doubt, was when my Kenyan colleague had a bunch of us over to his bachelor pad for a typical Kenyan meal. If there’s a kitchen around, that is where you will find me, and it was no different in his home. I jammed myself into the tiny kitchen and tried to help. We made 4 dishes one after the other on a single burner- a meat stew, a vegetarian stew for me (soy chunks, potatoes, tomatoes, carrots and onions). The third course was the must-have side dish in a Kenyan meal, the sukuma wiki (greens). 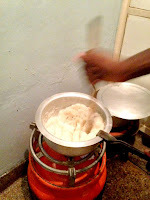 Finally, he made the staple Kenyan starch- ugali, cornmeal cooked in water into a thick solid pudding. Chunks of ugali are broken off and dipped into sauces and side dishes and eaten. Friday evenings after work we would go to a lakeside bar and watch the sunset over a Tusker and or Nile Special beer, or a spicy Stoney tangawizi ginger beer. Sunsets over Lake Victoria are spectacular and left me quite speechless. On the weekend, I went on a hike in the equatorial rainforest- we saw birds and monkeys, including a troop of baboons. Then we visited the family home of another colleague and his wife (a high school English teacher) who laid out a hearty Sunday lunch. She made a stew with soy chunks, carrots and onions and tomatoes, lentils, pilau (pulao cooked in stock), chapatti and cabbage. It was a pleasure to sit down to this big meal right after we’d been hiking all morning. 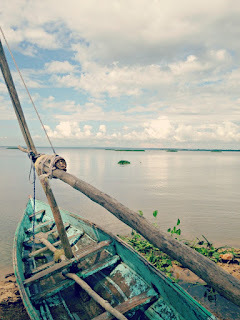 Lake Victoria is the second-largest freshwater lake in the world and dominates the landscape in this part of Kenya. I went out on a long boat ride at 6 AM to see the sunrise- again, a spectacular and memorable sight. There were beautiful water birds all around. But my favorite part was spotting the hippos. There is a herd of about 16 wild hippos in Kisumu bay and they are most adorable- those cute little ears! I saw a baby hippo and some adults. They snort and spout water and laze around in the lake. Hippos are also huge and territorial and they can move very fast and attack humans if they are annoyed, so it is best to coo at them from a safe distance, which is what I did. Kiswahili is a sweet language, the lingua franca of much of East Africa. During my time in Kenya, I learned a few phrases, apart from the all-important “food words” that I’ve mentioned before in the post. Asante sana (thank you very much), habari (what’s the news), karibu (welcome), hodi (knock knock), sawa (OK) and some Kiswahili slang thanks to one of my younger colleagues- I say mambo, you say poa. Oh, and kiboko (hippo)! Last week, I read a post titled 5 Things That Traveling Taught Me About Cooking and agreed heartily with what the author said. Here are 3 things that my Kenya trip taught me about cooking. 1. It is OK to eat the same thing again and again. What I saw of everyday Kenyan food was simple and humble with meals being much the same from day to day. And that is OK. Food is sustenance and not necessarily a big production in much of the world. I think I should stop worrying too much about serving something new and different every day. Lentils and sautéed veggies as the default meal works just fine. 2. Simple ingredients can make flavorful food all by themselves. The home cooking and canteen food I tasted in Kenya was very minimally spiced. Even the local Peptang brand hot sauce tasted absolutely bland to me. Dishes got their flavor from basic ingredients like onions, tomatoes and carrots. At some point, I wished I’d thought to pack a small bottle of sriracha sauce and lime pickle, but honestly, eating this way was a revelation. I'm going to try going easy on spices some of the time and let simple flavors shine. 3. Greens are good eats. In Kiswahili, the phrase sukuma wiki literally means to stretch the week, as in, cheap greens to stretch the more expensive ingredients of the meal. Sukuma wiki was my favorite thing about the food in Kenya. In the bazaar-type open markets, you can buy greens that are already finely shredded and ready to cook- 50 Ksh (50 Kenya shillings- approximately 50 cents) worth can feed a crowd easily. I loved seeing how easy it was to sauté them up and eat a big pile of greens at almost every meal. With the CSA boxes, I already have been eating more greens than ever this year, and this trip solidified my love for it. I feel so lucky to be able to spend some time in Kenya- a beautiful land, home to beautiful, kind and friendly people. A lot of the people I know who work on African projects find themselves falling in love with the countries and the people in spite of the challenges of living and working there, and I can see why. Life is tough but people are tougher. I was very sad to fly out of Kenya and equally happy to land in Atlanta- which I guess is the mark of a successful trip. V, Lila and Duncan managed beautifully on their own, as I knew they would. The only thing I did for them was to stock the freezer and pantry with prepared meals. Since Lila’s birth, I hadn’t been away from her for even a single night, until I left for weeks. But V is an extremely competent Dad and she is old enough to understand where I am going and that I will be back. They went camping one weekend. Some cousins visited another weekend. V was even a "dance dad" and got Lila ready for her first ballet recital. With V's month long India trip closely followed by my own, we're all happy to be on the same continent and looking forward to enjoying summer together. And I hope you have a wonderful summer too! What a lovely write up of your visit. Beautifully evocative and filled with good sentiments. So happy reading this on a very cold morning here! Hope your summer will be great. Thanks Poornima! We have lots of visitors and a bit of travel this summer, so it promises to be eventful. Bravo, Nupur, I loved every word of what you wrote. Have been eagerly awaiting this, and it (expectedly) exceeded expectations! Do read M.G. Vassanji's books set in Kenya - Tanzania- The Book of Secrets and The In-between World of Vikram Lal are lovely reads; also books of short stories, like The Gunny Sack. Thank you Kamini! I so wanted to read some Kenya/Africa books before I went there, but it sounds like a fun summer reading project. Thanks for the recommendations! Welcome back Nupur! Couldn't wait to hear about your trip and was happy to see the update on the blog! Lovely account! You must write more about your local encounters. Kudos to V and Lila for making it through your absence. Thanks :) Yeah, I don't think V and Lila missed me that much ;) they are pretty self-sufficient. Such a beautiful, heartfelt post Nupur! I missed reading your blog on the weeks you were away. It's my first time commenting though I've been a long time reader. Can I just say just how much I respect you for everything you do - cooking, reading, your parenting style, not to mention how you pursue your hobbies? You should do a post on time management - it would help a lot of people like me. I'm a stay at home mom of two kids 5.5 and 1 and live in Bangalore. Totally agree with you! I have been reading Nupur for years and I am amazed at how she packs so much in a day :) very inspiring. Unknown- thank you for your kind words! And just know that as a stay at home with two little kids, you're already doing everything and more. But it is immensely rewarding to make some time each day to do something YOU love. Kavs: You are very kind and you are way over-estimating me. I only work 3 days a week which opens up more time than most people get to have. Welcome back Nupur! You were missed. I really enjoyed reading about your trip. Kudos to V, Lila and Duncan for managing so well, wish you all a very happy summer too! Such a lovely post Nupur! Thanks for sharing your experience. You gave us a virtual tour of Kenya. So nice of Lila to manage well without you. Rehana- Yes, Lila is a very go-with-the-flow kind of kid which is a relief given how the routine has been shaken up in recent months! Glad to have you back home, safe with your family to enjoy rest of summer. Meena- The funny thing is that I am a confirmed homebody and never look forward to traveling. But this trip took me out of my comfort zone and I am better off for it! It worked because I wasn't staying in a hotel and sight-seeing but instead getting to live alongside locals and experience routine life there. Welcome back, Nupur! Your Kenya experience sounds lovely. It was, Radhika! I would go back in a heartbeat. Your adventure sounds like such an..well adventure! So much fun. Kenya is beautiful. A friend of mine is stationed somewhere near Kisumu for past couple of years and I get to see his pictures on Kenyan life as well. I totally agree that food should be more about sustenance than anything else (for most of the times at least). Takes off so much pressure based around those "what shall we eat for this meal?" kind of questions. Kenya is beautiful! And I only just got to see a tiny corner of it, I am told this small country is full of natural treasures. Thanks so much for sharing your experience. I have so little first hand knowledge about Africa that I am always curious about the culture and way of life. My brother visited South Africa last year and was surprised by the Indian influence there too. Arpita- It was a totally new experience, yet very familiar because India and Kenya have much in common. I'd love to go back! Beautiful description of Kenya and your time there. I love greens and therefore very much intrigued by sukuma wiki . Hoping you will post your take of the recipe soon . Also did you get a chance to try the african peanut stew ? Alpa- I'll definitely post my version of sukuma although it is the simplest dish- just sauteed greens sometimes with onions and tomatoes. As for peanut stew, that's mostly a West African thing. I was in East Africa and never saw it there. So good to hear about your visit to Kenya, Nupur. Nairobi reminded me so much of old Bangalore when I went there years ago. Lucky that you not only got to eat and live like a local but also got to work in their country. Though I think you missed a trick in not tasting mandazi. My Tanzanian friend feeds me the little coconut treasures and each time I sink a little deeper into her sofa. Abhi- I know- what a fool I am to not try mandazi! Oh well maybe on my next trip ;) the ones they had were HUGE so I demurred. I never did get to see Nairobi although I flew through there. Such a lovely account of your trip! So what was your first meal back home? TheCooker- Good question :) I had stocked the freeze with several meals, and V had thawed out the very last one- a box of rajma. So the first meal back was rajma and yogurt. I was looking forward to this post and thoroughly enjoyed it. Travel changes us and the 3 things you mentioned remind us how spoilt we are for choice in our own lands. Enjoy your summer and family time together! Anjali- Hi! Yes, that's the feeling I got- that both in India and in the US, with the overflowing subzi mandis and supermarkets, we are spoiled with an amazing assortment of food which is such a privilege. Want to add, loved the panorama and all the pics in this post. Thanks- it is so beautiful there that it is easy to take gorgeous pics. Loved your post! Opened onehotstove today hoping for a new post and voila! Glad you enjoyed your trip and we enjoyed the wonderful travelogue :) Enjoy summer with your family. Thanks Rashmi and hope you have a great summer too! I was eagerly waiting for your post about Africa. And here it is! Thank you very much for a wonderful recap and introducing us to a beautiful country! Divya- That's wonderful! Kudos to you. The small changes add up. Wishing you the very best. HI R! How are you? I do feel so very lucky to be able to travel to Kenya. I don't get out much so it was a different experience. I'm still doing zumba- only once a week, but I absolutely look forward to it. Have a fantastic summer- hugs to you!! Nupur, I loved reading about your Kenya travels and seeing all the pictures. What was the best part of the travel? How did the not so little one now do in your absence? When are you all coming back to my neck of the woods?